Too tired to comment. *yawn* But, if you’re curious Mordred is still wearing his pajamas. I’m going to sleep. Thanks for reading! You stole my thunder with the whole cell phone/heart comment, and I know you did it deliberately. Rrrr, rrrr. 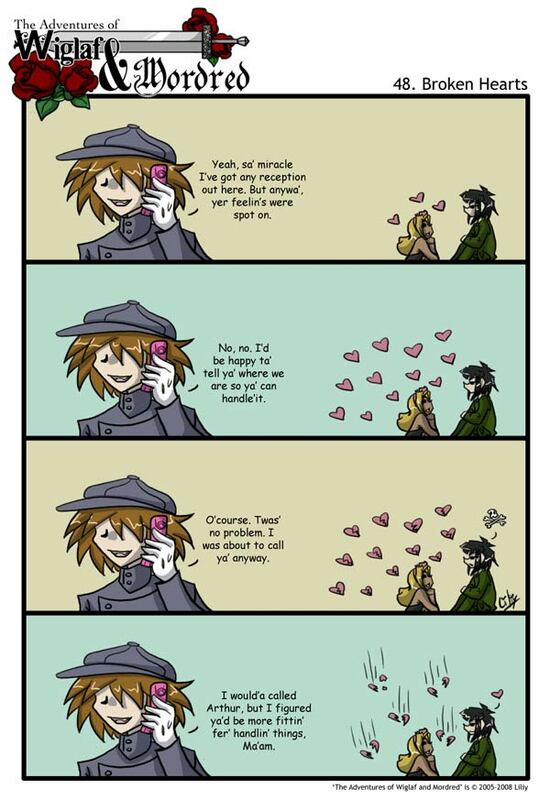 Still, Mordred and Brat in the background make me laugh no matter how many times I read this. Here’s something I never thought about: Driver reports to Arthur, but she doesn’t think he’s as capable as Janus. And Janus’ Mordred senses have been tingling all the while. Dun dun dun! Wait, wait. “Ma’am”? Is she talking to Janus, or Mordred’s MOTHER? Whoa. If Driver is contacting Janus, then she must be really desperate. We already know that Driver hates Janus (everybody seems to hate her), so perhaps she simply wants to use Janus’ destructive tendencies for her own purpose of rubbing out Brat. Unless it’s not Janus…which means there’s someone new and unknown that Driver is summoning. Boy this is getting good! I wonder if Arthur will be angry if he finds out that Driver is making secret connections behind his back. That could be a recipe for real chaos, especially if it brings him back into conflict with Wiglaf. There are just so many mysteries and possibilities. Man, I am REALLY enjoying this! The Brat’s expression doesn’t change at all throughout this.